In the past half century, state lawmakers have explored a wide variety of approaches to scaling back property taxes. One such approach is the split roll property tax, also known as a classified property tax. Unlike a regular property tax system which taxes all types of real property at the same rate, a split roll property tax applies different tax rates to different types of property. This policy brief looks at the advantages and disadvantages of the split roll approach. The idea behind a split roll property tax is simple: certain types of property (usually residential) are taxed at lower effective tax rates than other types of property (usually business). One approach to split roll taxation is to apply different tax rates to different types of property. For example, the District of Columbia taxes residential homeowners at a lower rate than business properties. This shift s some of the property tax from homeowners to businesses. 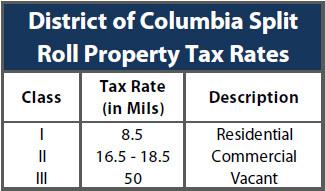 The chart on this page shows the current tax rates in the District of Columbia. All homeowners pay the same tax rate (8.5 mills, or 0.85 percent of the home’s taxable value), and all commercial properties pay a tax rate that is roughly twice as high—between 16.5 and 18.5 mils, depending on their precise value. Vacant and abandoned properties pay at an even higher rate of 50 mills. A second approach to split roll taxation is to assess residential properties at a lower percentage of their true market value than other types of property. For example, Utah assesses all residential properties at 55 percent of their actual value, and assesses all other types of property at 100 percent of their value. A single tax rate is then applied to properties of all types within each taxing district. This approach has exactly the same impact on tax fairness as the District of Columbia’s approach of using different tax rates. Split roll systems are currently used by over a dozen states. Split roll taxation is usually implemented as a means of reducing property taxes on home owners. As implemented by the District of Columbia and other jurisdictions, the split roll clearly achieves this purpose: every homeowner in the District pays less property tax as a result of the split roll’s preferential tax rate. This approach to property tax relief also clearly achieves the goal of increasing property taxes on businesses. Policymakers in many states have sought to implement a split roll tax as a response to a legitimate concern: that business does not pay its “fair share” of property taxes. However, split roll taxation has important shortcomings. First, it is a poorly targeted approach to tax relief. Because every homeowner in the District of Columbia pays a lower tax rate due to the split roll—from the poorest to the wealthiest—the split roll does nothing to distinguish between different taxpayers’ ability to pay these taxes. And because the only qualification for this tax break is owning a home in the District, the benefits go not only to District residents but to residents of other states who own a second home in the District. A better-targeted approach to property tax relief would provide tax cuts only for the low- and middle-income homeowners for whom these taxes are most burdensome. A second disadvantage of the split roll is that a shift of property taxes away from one type of property means a tax shift onto other types of property. Unless the residential taxpayers receiving a tax break include renters, the split roll can make property taxes less fair by shifting the property tax from homeowners to low-income renters. For example, the District of Columbia split roll tax originally taxed residential rental apartments at a higher rate than the homeowner rate—unintentionally imposing a higher tax rate on low-income renters. The split roll approach also makes property tax administration more complicated. Assessors must determine not only the value of each property, but its classification. This gives owners of properties taxed at higher rates an incentive to mislead assessors, or to change the use of their property to take advantage of the lower rates. And taxing mixed use property can present additional administrative challenges for tax administrators. Finally, because the split roll is completely disconnected from ability to pay considerations, two property owners at a given income level, with similarly valued properties, could pay at very different property tax rates simply because the properties are used for different purposes—undermining the perceived fairness of the tax system. There are other property tax relief mechanisms that are at least somewhat better targeted than the split roll. Homestead exemptions, which usually reduce the taxable value of homeowner properties by a fixed amount, are generally available to all taxpayers but provide proportionally greater tax relief to low-income homeowners. And “circuit breaker” tax credits can be designed to apply only to low-income taxpayers, with no benefits extended to wealthier homeowners. Each of these alternatives can achieve targeted property tax cuts to those who need them most, and at a lower cost than the split roll. In states that currently use the split roll, these alternatives could be introduced in a revenue-neutral way to re-allocate existing property tax relief dollars between income groups. 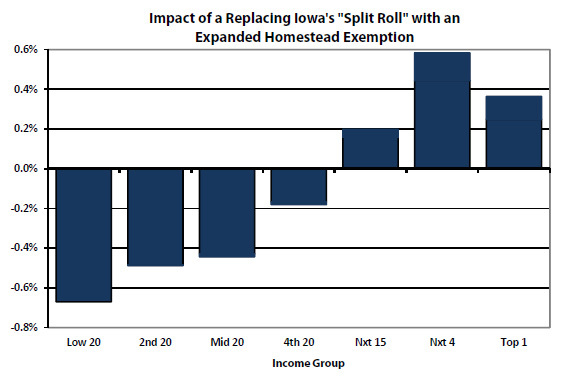 The chart on this page shows the distributional impact of replacing Iowa’s preferential residential property tax assessment with an expanded homestead exemption. The total amount of property tax relief granted by the state would remain unchanged, but this change would provide property tax cuts for the poorest 80 percent of Iowans, on average. Split roll property taxes are a very broad and poorly targeted means of shifting property taxes away from residential properties and onto business properties. If lawmakers are interested in ensuring that business “pays its fair share” of property taxes, the split roll can be a sensible alternative. But if lawmakers are primarily interested in targeting property tax relief to low- and middle-income taxpayers, a homestead exemption or “circuit breaker” credit is a fairer, more cost-effective approach.